Kat Loughrey recently caught up with She Hacks runner-up Jackie Antig, on her first-time hackathon experience. If you somehow missed it, Melbourne recently played host to its first ever all female hackathon called She Hacks. Girl Geek Dinners ran the event with the aim of bringing together groups of women across different skill sets to engage in collaborative computer programming. The theme was ‘Communities & Neighbourhoods’ and each group was provided the space, and support via industry mentors, to develop and nurture an app concept in less than 24 hours. As a mentor, I was suitably impressed by the creativity, ideas and sheer determination by the teams to produce a high quality product and prototype within this tight timeframe. Selling out within a week and with the participant’s donations going to One Girl, the event was definitely a huge success and a big win for local women in tech. It showcased just how many talented women there are locally – and generated positive media coverage in the process. To ensure success within the teams, each group was required to include three different skill sets: think Hipster (designer), Hacker (programmer) and Hustler (marketing and business – growth hacker). The Fetch Community Ambassador Jackie Antig assumed the hipster role within her team, and shared with me her recommended tips and insights on presenting at a hackathon. What inspired you to participate in She Hacks? I’ve been wanting to participate at a hackathon for years, but I didn’t have the courage to before. I am a bit of a shapeshifter across product feature development, communication and design for technology but I only know how to do a couple meagre lines of code (that may change in the future). I had falsely assumed that you had to be a true-bred coder in order to be a successful participant at a hack. She Hacks did a particularly swell job at rolling out the welcome mat for all backgrounds. Of course, the focus on supporting and promoting women in technology was the biggest draw. One of the roads to closing the gender gap in the sector is skill development. Another road is building up confidence by being challenged and overcoming the challenges in a wicked smart, supportive environment. Girl Geek Dinners Melbourne and She Hacks takes care of both ends. In making your final pitch, each team only had three mins to present. How did you find this and working with the team, to pull a presentation together with limited time? In the beginning we were quite ambitious about the amount of information we were going to fold into the pitch. Our early time trials proved we needed to pare down. We prioritised defining the problem statement clearly, our product prototype demo and the storyline about how it addressed the problem statement. We sacrificed the gory details about business forecasting and sustainability but had a feeling that the judges would likely tease those elements out in the question round. There’s so much you could include but with limited time, what are the top five things you’d recommend that you should make sure to include in your presentation? Problem, solution, empathy, feedback, and actionable idealism. Identify a clear-cut problem, design a solution driven by empathy and test your assumptions. Display a sense of actionable idealism; dream up something wild but show you know how to break it up into realistic bite-sized pieces and steps. I noticed that most groups used slides and visuals. What do you think are “must-haves” in the way of visuals for your presentation? She Hacks had an impressive panel of judges (see list here). Knowing who they would be, did that change the way your team decided to present? What do you think the judges were looking for from the teams? We kept their background separate from our approach. The three minute time limit was the cracking whip against our backs. I would say they seemed to be evaluating feasibility and real-world application. Best part of the pitch presentation? The rush to get up and tell everyone about what we came up with. Worst part of the pitch presentation? The nagging feeling we forgot to mention something important. Would you participate in a hackathon again where you need to present/pitch? Absolutely! Already searching for the next one. What advice would you give to others doing a hackathon for the first time and for women considering participating in next year’s She Hacks? Your team came second, congratulations! So what’s next for your app idea: ‘Wake Up Dress Up‘? Thank you! We’re trying our best to follow through on actionable idealism. We will be doing a healthy dose of evaluating the morning routine needs of women and the current relationship-building models local fashion designers currently engage in with their customers through a combination of data gathering and ongoing conversation. SheHacks 2014 Melbourne from Inspire9 on Vimeo. 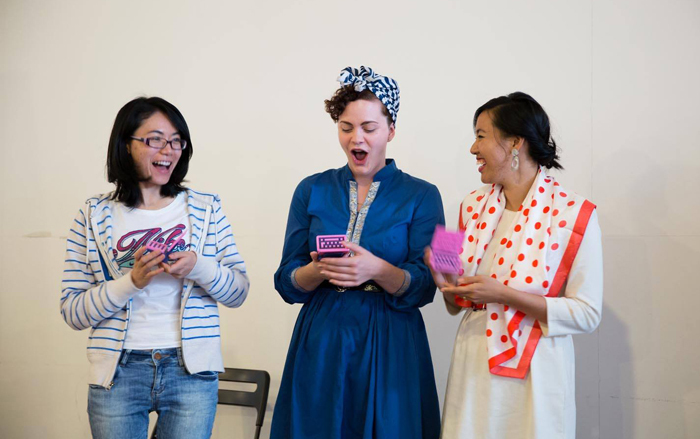 Thanks to the She Hacks official photographer, Yishan Chan Photography, for the photos. See her full gallery here from the event. About our Curator // Kat Loughrey is the Melbourne Curator of The Fetch, a community where professionals can discover and share what’s happening in their city. Originally from Brisbane, via Japan, Kat now lives in Melbourne – a digital content strategist by day and explorer of Melbourne’s digital/tech, arts and music scenes by night. Follow her on Twitter at @KatLoughrey & @thefetchMELB. own. Do you need any html coding expertise to make your own blog? I am really imprwssed with your writing skills as wesll as with the layout on your blog. Anyway keep up the nice quality writing, it is rare tto see a great blog like thus one today. the most up-to-date news update posted here. In the winter, the dog’s body heat is what helps to heat the house. you want to be able to use the boat inside waters. I found this during my search for something regarding this.